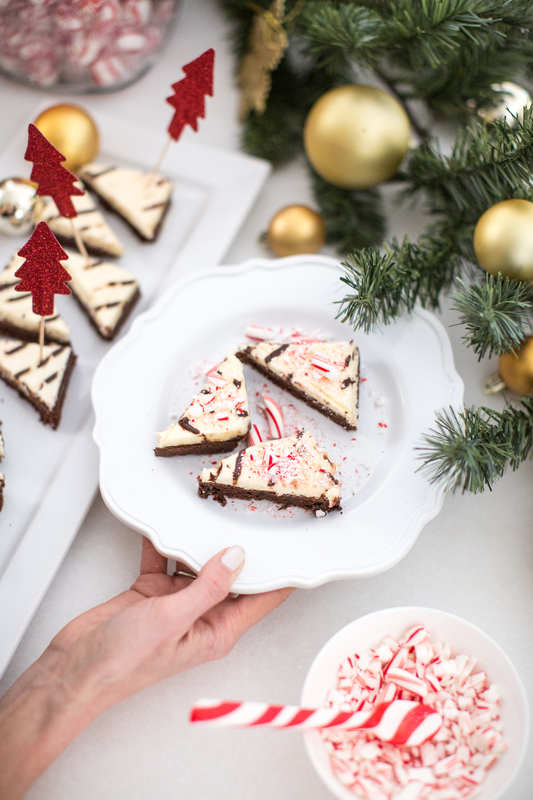 In partnership with Walmart, I made a Holiday Dessert Brownie Bar with the most festive DIY toppings for my next Holiday party. 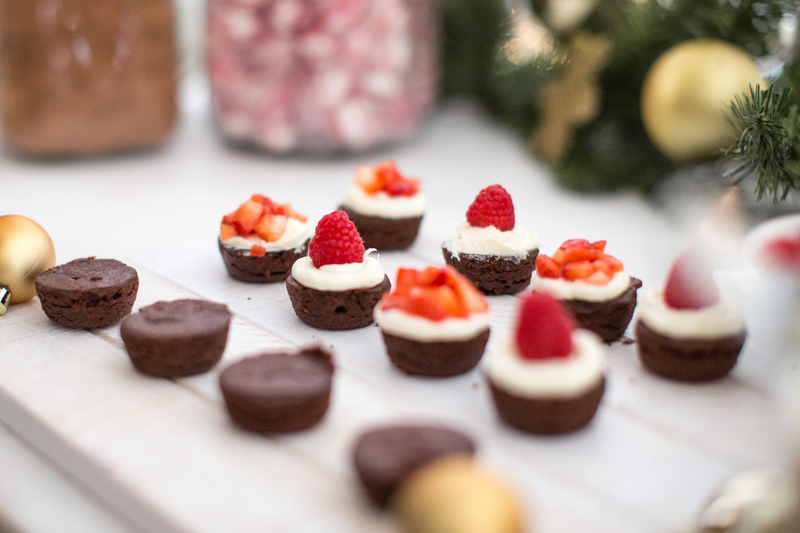 What’s on the menu: Brownies three ways – topped with crushed peppermint, icing and fruit, and topped with candy ornaments (ie. red sugar pearls). I saved time by choosing Walmart’s pre-made brownie bites and brownie tins and placed them on pretty platters. Then to drink I served the perfect compliment – hot chocolate which I topped with marshmallows and “hot chocolate” flavored Hershey Kisses. With Walmart’s massive holiday sections, I found all my decorations and peppermint essentials to bring the display to life. I took Walmart’s pre-made frosted brownies and cut into triangles and served alongside crushed peppermint. Guests could help themselves with a peppermint spoon and top with a red sequin tree topper (similar toppers on Walmart.com). I took Walmart’s pre-made brownie bites (which come in this adorable cupcake shape) and placed alongside vanilla frosting and a variety of fresh red fruits. Guests could frost their “bites” and top with diced strawberries or raspberries (resembling Rudolph’s red nose). I took pre-made caramel drizzled nut brownies which came in a tin and used Christmas tree shaped cookie cutters to trace the brownies into small trees. I placed them alongside “candy ornaments” (candy sugar pearls) for guests to decorate their “trees”. I filled tins (similar) with Hot Cocoa Powder, marshmallows and peppermints. I used burlap to tie a cinnamon stick and a faux evergreen branch to my Walmart ceramic coffee mugs. After guests made their hot cocoa, they could top with “hot chocolate hershey kisses”, marshmallows, and peppermint. Who’s getting in the Holiday spirit now! Start shopping Walmart to prep for the Holidays.